Mathew 15:24 for this my son was dead and is alive again. Man was created to have fellowship with god but the serpent(devil) was cunning and wanted to destroy this bond between god and man. God wanted a true fellowship with man so he visited to him every evening not to behold the beauties of the things he made but to have a fellowship with man who was made in his own image and likeness. The journey with god started from Eden garden but by seeing an opportunity Devil came to Eve when she was alone. The serpent came before god’s visiting time and saw the best opportunity to deceive Eve because she was alone. It means she was idle. An idle mind is devil’s workshop. Devil knew that she can be attacked easily when she is alone. The greatest trick of Devil today is to give you the feeling that you are alone and that makes his job easy. Because of sin the bond between the relationships was marred. There was a great gulf between the fellowship of God and man but still many walked with god even though in that cursed situation…Enoch, Abraham, Noah, Isaac, Joseph and many more their journey on that cursed generation was with god that’s the reason why they were blessed among the cursed. God wants to speak to the reader through this blog. No matter you may be surrounded by the darkness and curses but if you take a decision to journey with god….he will bless you among all. Let our life’s journey be with Jesus, let us learn from him and seize all opportunities of our life. Once, we planned to visit a castle in Germany but since we don’t the know the place we were in trouble but when we found one guide who knows about that place very well. Now we don’t have to bother where we should go and what we should do…because we have a guide. Like wise if we do not have god with us in our life’s Journey it will lead to a life full of troubles with no hopes. The message for today is about the Son who was in a journey without his father. 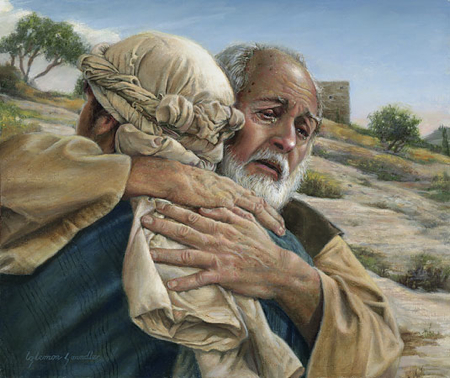 We all know this incident it is about Prodigal son. Now Luke Chapter 15 is the chapter of repentance. We are into a race(journey) and the one who is in this race must run with endurance without doubting. An athletic will not dress up with suit to run but he will remove all that and wear his tracksuits. He cannot run with burden on his head. He must free himself with all burden and train himself fit for running. He must quit some diet and must give time for daily exercise. Likewise every believer is on a race and our finishing point is house of the lord. A believer must not run with burden on his head he must cast his entire burden unto Jesus. He must quit something in his life, he must come out of his comfort zone, and he must crucify all his worldly desires and lust of the flesh, a daily reading of bible to know how fit he is. This chapter is also speaking about one Journey of a younger son who left the house and his father to a far country. There are 3 different kind of example illustrated in this chapter one is about A lost Sheep , A Lost Coin and The Lost son. The sheep find his shepherd by the voice; the woman found her coin when she lit the lamp but the love of father bought the lost son back home. Which is so true in our life … the voice of the lord came searching us, the light of this world step down to find us and his love bought us back from the place where we were totally lost. All glory to Lord Jesus. Luke chapter 15:24 says for this my son was dead and is alive again. Now my question to the reader is the son was really dead? No he was not dead practically but since he is not having any relationship with his father he his dead and lost for him. Now I want to go little deeper of this text , I am purely talking about spiritual death rather than body…One day the younger son asked his father for his portion. He did not ask this to leave him initially. But he was more blessed; his relationship must be stronger than before because he received his portion from his father who shows that he is mature to handle the blessing but unfortunately it happened other way around. Now the verses 13″Not long after that, the younger son got together all he had, set off for a distant country and there squandered his wealth in wild. What was the thing that made him to take stupid decision like this? Did he not loving his father? How can he leave his father like that…if you read it says not long after that he received the portion. It means it took him less days to take his decision to leave his father…I believe he use to visit his father daily and they both use to spent lot of times together but after receiving his portion(blessing) he visits seldom, now he is spending less time with his father, there is nothing much to discuss between them. After some more days he started visiting his father once in a week just for name sake. And not long after that he stopped visiting his father; this made a great barrier between these two. Now his journey for a distant country is without his father. I don’t know how many of them understood the spiritual side. We are sons of god, an heir who has an authority, we have received our portion from our father like prodigal son and tasted his glory in every way of our life but do you hold the same relationship with him now? We just go once in a week to church just for the name sake, before we use to cry, we use to pray constantly, we use to trust him only, we use to keep his words. After receiving all the blessing from above, received all promises and portions which we asked for. What is the situation now? Are you on a Journey without the Father? You are praying, you are giving tithes, you may be the elder of the church but ask yourself sincerely that if you have Jesus in your journey. Remember, we are blessed because the father is with us; we can cast all our burdens when our father is close to us. I never carry money in my wallet when I am with my father because I know whatever I he need have it. Dear reader, you have a father who cares you but are you still taking your pain by yourself and are you still on a journey knowingly or unknowingly without father? This son squandered his wealth in wild living. The devil was not jealous about the wealth but he jealous about the relationship. He knew if this Journey of both father and son continues he will be in problem so the only thing to destroy this bond is to separate both of them gradually. My fellow brothers and sister this is what the liar devil does in our spiritual life… he will never destroy the bond between you and god altogether but he will try his tactics gradually step by step. Always remember Devil has more patience than you and me…he will wait for an opportune time and alas we will not know that we are travelling all alone…Mary and Joseph walked three days thinking that they have Jesus with them but while they waited and looked themselves they dint found him…..what was the reason they lost Jesus on their way…I think both of them were so much into the crowds and different voices from all around distracted them. Are you a person who is distracted by something of this world? Dear Reader Holy Spirit guided me to write this because of you …Wait for a moment and check yourself that if you are walking with god? Devil wants that you should walk alone. A Journey without our father in heaven brings both spiritually and mentally dead situation. What did the father do to his lost son…he did not give him wealth but he gave exactly what he have lost…the relationship…he hugged his son and gave him Best Robe, the ring and sandal…old clothes were removed it mean old sin was washed away and gave him a best robe, he gave him a ring which shows authority and a sandal because the journey is tough. Tomorrow is not for you; even you don’t know what will happen at next hour. Jesus is waiting for you to receive you as his son. Seize this opportunity and have a personal relationship with Jesus. I urge all believers, non- believers, pastors, brothers and sisters and all whoever read this….Start a personal relationship with Jesus today because his coming is near, walk with him, seek him and wait patiently for him. If a journey without father leads to death then what will be the Journey with the father …it will lead us to everlasting life.